Ammonia is the most lethal form of chemical toxic to fish and aquatic plants. It will directly cause burns to the to the skin layer leading to redness, clamped fins and in worst cases, concentration of 0.2 – 0.5ppm is enough to kill all the fish in an aquarium. Ammonia poisoning is considered a common threat effecting newly setup aquarium whereby colony of beneficial bacteria has yet to establish. It is also sometimes referred to as “New Tank Syndrome” and aquarium owners often get shocked upon seeing all the fish die at the same time. Usually the condition will subside once the bacteria Nitrosomonas starts to proliferate to adequate levels leading to breakdown of the chemical to nitrite. A fully cycled tank should have zero ppm ammonia. The only way to deal with the problem to contain the situation is by performing large water change (about 70% the volume). Usually the process can be hasten by getting a scoop of water from established aquarium and mix it into the new tank. Monitor ammonia levels at all times during the initial aquarium setup period and act immediately upon noticing weird behavior and reduced activity observed on the fish. Nitrite is considered less harmful but if were to leave unchecked for longer period of time, it can still pose life-threatening effects to the aquatic community. It can irritate the skin and gills and causes increased stress to the fish rendering them lethargic and susceptible to illness. Usually, there are different approaches to deal with the problem. First you can consider reducing amount of food fed to the fish or either way increase your frequency of water changes. Fish intoxicated by nitrite poisoning can be treated by increasing the aquarium salt concentration to 0.5% level. If everything goes on well and strictly monitored, soon as time passes by, Nitrobacter bacteria will start to proliferate and perform breakdown of the nitrite into nitrate. Nitrate is generally non-toxic. However at higher level of concentration, up to 300 to 400 ppm will start to create the level of unhealthy living environment for the aquarium fish. Nitrate poisoning can actually be dealt with easily and unlike ammonia and nitrite, the level can be significantly reduced if there are presence of aquarium plants to consume it. Sometimes it is also good practice to leave a healthy growth with a carpet of algae at the corner of the aquarium if you decided to have a bare aquarium with plants for easy maintenance. A good recommended figure for the nitrate level in an aquarium should be in the region of 40 – 50 ppm. In order to give a better view and understanding, refer to the above diagram to help you out. 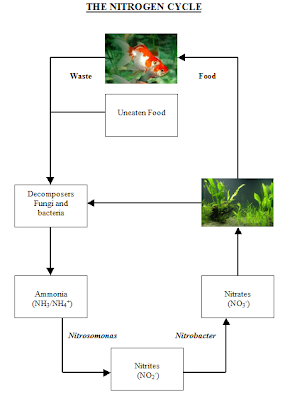 The nitrogen cycle is plays an important role to convert waste and uneaten food to nitrate, which is actually fertilizer for the aquarium plants. Bacteria is the core to the whole process.